Florida divorce law requires a Parenting Plan for all divorcing couples with children since October 1, 2008. Formerly known as a visitation schedule, a Parenting Plan is required in most new cases that involve children. Florida law has had a strong public policy about children and divorce for several decades. The Parenting Plan requirement must be met for all Florida divorces involving children and custody and visitation cases. It is the public policy of this state to assure that each minor child has frequent and continuing contact with both parents after the parents separate or the marriage of the parties is dissolved and to encourage parents to share the rights and responsibilities, and joys of childrearing. Florida law divides parenting issues into three categories: parental responsibility, time sharing, and support. The law requires divorced parents share parental responsibility for their child after divorce, unless shared responsibility is detrimental to the child. The goal is to keep both parents involved in the life of the child. A Florida Parenting Plan is required in all cases involving time-sharing with minor children, even when time-sharing is not in dispute. When should Florida parenting plan form be used? This form or a similar form should be used in the development of a Florida Parenting Plan. If the case involves supervised time-sharing, the Supervised/Safety Focused FL Parenting Plan, Florida Supreme Court Approved Family Law Form 12.995 (b) or a similar form should be used. This Florida Parenting Plan form should be typed or printed in black ink. If an agreement has been reached, both parties must sign the Florida Parenting Plan and have their signatures witnessed by a notary public or deputy clerk. After completing this Florida Parenting Plan form, you should file the original with the clerk of the circuit court in the county where the petition was filed and keep a copy for your records. If an agreed Florida Parenting Plan is not filed by the parties, the Court shall establish a Florida Parenting Plan. 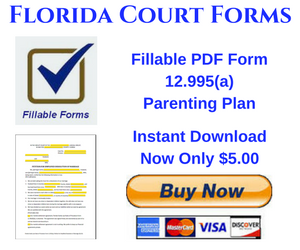 The Twelfth Judicial Circuit has an excellent on-line page about FL Parenting Plans. We highly recommend it. The best interests of the children is the primary consideration in the Florida Parenting Plan. In creating the Florida Parenting Plan, all circumstances between the parties, including the parties’ historic relationship, domestic violence, and other factors must be taken into consideration. The developmental stages and needs of the children and the demonstrated capacity and disposition of each parent to meet the children’s developmental needs. This standard Florida Parenting Plan form does not include every possible issue that may be relevant to the facts of your case. The Florida Parenting Plan should be as detailed as possible to address the time-sharing schedule. In developing the Florida Parenting Plan, you may wish to consult or review other materials which are available at your local library, law library or through national and state family organizations. Shared parental responsibility means that both parents discuss and decide major decisions affecting the child. For an older child it means making decisions about issues like part-time employment, driving, buying a car, dropping out of school, and college education. As your child gets older, consider having a joint discussion on these issues with your child. Of course, the child should never be responsible for any final decision. Transportation - How do the gets get between homes? Where is the exchange point? What are the details of transportation between the two homes? Who is driving? What time? If you use the school as the exchange point, what happens when school is not in session? Relocation - Under what circumstances will the custodial parent be able to move away with the child? (If you do not decide this now, you will have to follow the procedures of Fla. Statute 61.13001. Religious Affiliation and Training - Is there agreement to raise the children in a specific faith? How will the costs associated with religious affiliation and education be paid? What is the transportation plan? Are you both agreeing that the child will attend certain religious events or education, regardless of whose parenting time is used? Will these decisions be delegated to the parent who feels this area is more important? If so, will that affect the cost sharing in any way? Emergencies - What is the time frame for notifying the other parent? What authority does the parent who has the child have to consent to treatment? Make-up Time - If one of you is unable to exercise time sharing with the children, under what circumstances will there be make-up time? Recreational Activities & Vacations - How will the costs associated with activities be paid? What is the transportation plan? Are you both agreeing that the child will attend certain activities, regardless of whose parenting time is used? Will these decisions be delegated to the parent who feels this area is more important? If so, will that affect the cost sharing in any way? When will vacation plan be made? Will the children have passports? Which of you will hold the passports? How and when will the other parent get the passports if needed for vacation? Parents may want to divide up the areas, each taking responsibility for certain ones. Some parents prefer to meet and discuss all issues together and reach a joint decision. Others may allow one parent to make the decisions and inform the other parent. There are no set rules for shared decision making, but the new law requires a description of how the parents will share the daily tasks of child upbringing and time sharing with each parent. The Florida parenting plan must also describe who is responsible for health care, school matters and activities and what communication methods the parents will use to contact the children. Parents’ post-divorce decision making process is often the same type of process they had during the marriage. When developing a Florida parenting plan, consider how the decisions have been made in the past and what changes may be needed to that process now that the parents will live apart. You must describe the decision making process your family will use in your Florida parenting plan. Florida’s “best interest” of children factors will change on October 1, 2008. Notice the clear emphasis on demonstrating parenting behaviors and a history of meeting the child’s needs. Keeping children away from the divorce case is another area that is now clearly spelled out in the law. (a) The demonstrated capacity & disposition of each parent to facilitate and encourage a close & continuing parent-child relationship, to honor the timesharing schedule, and to be reasonable when changes are required. (c) The demonstrated capacity & disposition of each parent to determine, consider & act upon the needs of the child as opposed to the needs or desires of the parent. (e) The geographic viability of the parenting plan, with special attention paid to the needs of school-age children and the amount of time to be spent traveling to effectuate the parenting plan. This factor does not create a presumption for or against relocation of either parent with a child The permanence, as a family unit, of the existing or proposed custodial home. (i) The reasonable preference of the child, if the child is of sufficient age. (j) The demonstrated knowledge, capacity, & disposition of each parent to be informed of the circumstances of the minor child, including, but not limited to, the child’s friends, teachers, medical care providers, daily activities, and favorite things. (k) The demonstrated capacity & disposition of each parent to provide a consistent routine for the child, such as discipline, and daily schedules for homework, meals, and bedtime. (p) The demonstrated capacity & disposition of each parent to participate and be involved in the child’s school and extracurricular activities. (q) The demonstrated capacity & disposition of each parent to maintain an environment for the child which is free from substance abuse. (r) The capacity & disposition of each parent to protect the child from the ongoing litigation as demonstrated by not discussing the litigation with the child, not sharing documents or electronic media related to the litigation with the child, and refraining from disparaging comments about the other parent to the child. (s) The developmental stages & needs of the child and the demonstrated capacity and disposition of each parent to meet the child’s developmental needs. (t) Any other factor that is relevant to the determination of a specific issue. These are the factors a judge will use when determining all child-related issues starting October 1, 2008. Now that the law has changed, there will no longer be a “primary residential parent” and Florida parenting plans are now required. Much more than a visitation schedule, Florida parenting plans must be comprehensive and cover not only time sharing, but decision-making and child support.